Hello, and welcome to the online home of writer Bruce Elgin. 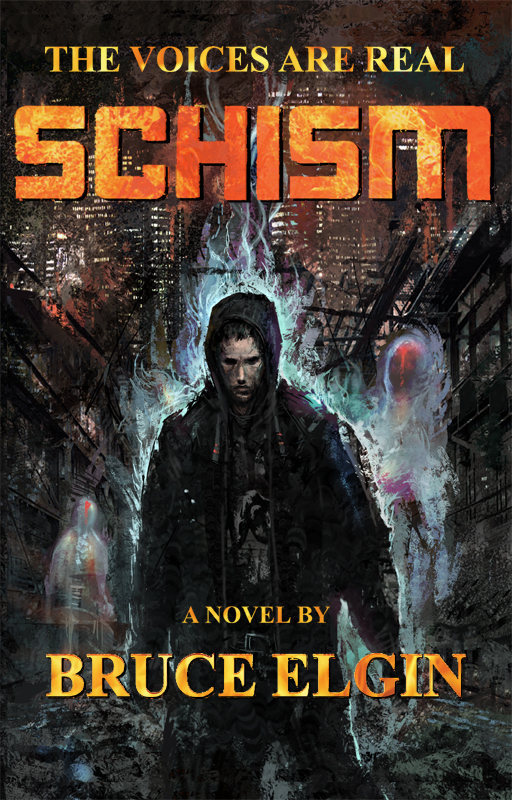 My new novel, Schism, is now available for you to listen to or read online for free. To read Schism for free visit my Wattpad page. Wattpad is a site for readers and writers. You can read Schism there without signing up, but if you take the minute to log in (it’s very quick and simple), then you’d be able to follow me there, leave comments and mark each chapter of Schsim as a favorite by clicking on the star button (All of which are very much appreciated!). If you’d like to listen to Schism, just go to the audio section here on my site. I currently have half the novel up on audio, and plan to do the second half sometime in the near future. William Adams has always heard the voices. They tell him things he would have no way of knowing and make him help others, but all they’ve ever done for him is get him committed to a mental institution. When they tell him he has to protect his ex-fiancée, he escapes and finds himself caught between a racist mastermind and a man whose abilities are even more dangerous than his own. With a police detective as his reluctant ally, William’s only chance of saving the woman he loves is to push beyond the boundaries of what the voices tell him, or to die trying. Hip, hip hooray! So excited to see “Schism” in so many places! Hopefully, everyone will love William Adams as much as I do! I loved Schism! Although sometimes it got me thinking if William was really crazy, anyway job well done!!!! Thank you! I’m very glad you enjoyed it! Wanna know a secret? William is the only sane one. Chapter 15/2 …Just now getting my mind wrapped around the fog thing…and I think they are all a bunch of Crazies…and Jared is a cowardly punk!!!! I don’t usually read books like this, have always been a fantasy type reader. I downloaded this on my phone and holy crap I couldn’t put it down! Excellent, excellent read, I will purchase any and all books written by Bruce Elgin from now on. Can’t praise this enough! Thank you very much for the kind words! I’m very glad you took a chance on it and that you loved it! Mind if I ask where you downloaded it? I just finished Schism. Now I have to do all the work I neglected while glued to every page! I bought it at dodici’s shop. I will recommend it to my high school readers. I’m very glad that Schism kept you from work! That’s the best praise an author can get. And thank you for recommending it to your students!